We are engaged in offering a wide range of Platinum Catalyst. These are processed using best available technologies and using optimum quality raw materials. Owing to its purity and optimum quality, these Platinum Catalysts are extensively used by various numbers of clients. these are extensively acclaimed for their optimum quality and effective usage. besides, these are available with us in various specifications and at reasonable rates. Known for exporting, wholesaling, importing and trading a wide range of premium quality Scrap and Metal Catalyst, Steels And Scrap started its operation in the year 1993. Our effective product range is inclusive of Stainless Steel Scrap, Nickel Scrap and Metal Scrap. 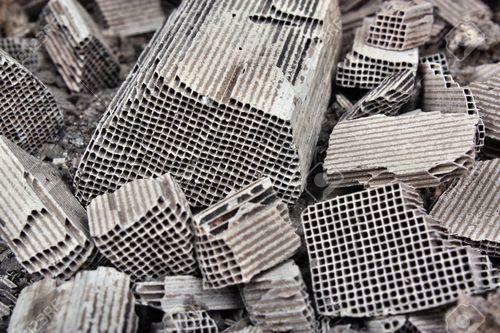 Used in various metal recycling industries, the offered Scrap and Metal Catalyst are procured from trusted and reliable vendors of the industry. Due to its optimum monetary value, which is due to its optimum recyclability, the offered range of Scrap and Metal Catalyst is highly demanded in the market. We export our products to USA and import from China. Our ability to manage bulk demands within the assured time frame has helped us in catering to a huge clientele across the world. Quality being our utmost priority is maintained at all the times through various quality conscious checks conducted at our end. In addition to this, the offered range of Scrap and Metal Catalyst is available with us at competitive prices. Keeping the convenience of our customers, we offer them with different modes of payment and shipment.